This suburban Detroit-based medical practice sought updated website design with increased local SEO rankings, plus vastly improved website conversion. 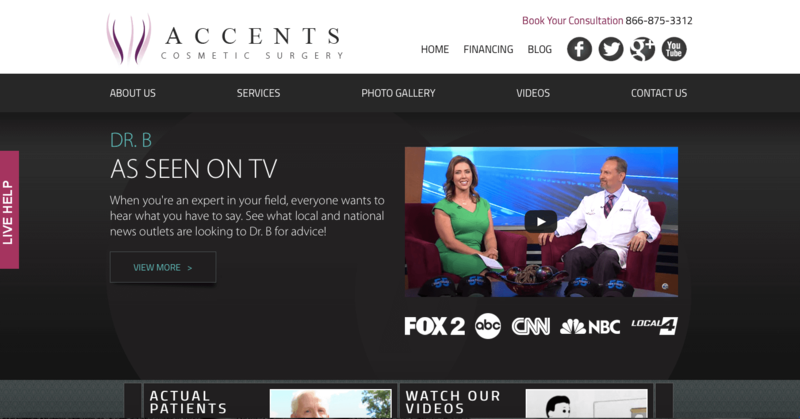 Over the course of the first year we worked with the practice to overhaul the visuals on 2 separate sites - one dedicated to plastic surgery with the other focused on hair restoration - improved organic SEO throughout the Detroit, Ann Arbor, and surrounding areas, and significantly improved lead counts. The sky is the limit in the coming years for this growing practice. Visitors vary widely in what makes them wish to purchase. Some want a doctor with great education and experience, while others seek a warm bedside manner and belief in charity work, while still others prefer a doctor with fame and endorsements. So why not feature each of these on your website using what we call "Trust signals." Trust signals can include logos of magazines, schools, tv shows and more in which the business owner has appeared or been educated. They can include tv or radio or podcast clips. And the more you have on your website the more trust and credibility you build. In this case SEOversite worked with the web development and SEO team to showcase the doctor to meet the expectations of a wide variety of potential shoppers. A common mantra here at SEOversite is "more calls to action." Many website visitors never see your home page. They find your website through landing pages, blogs, gallery results, and looking up the doctor by name. Make it easy to contact you. Here we see simple contact boxes along the side of the screen, a live chat pop out, a "contact us" link in the menu bar, and a phone number all in a single screen shot. This is also done without seeming overwhelming, pushy, nor invasive, telltale signs of superb design. While quality is of utmost importance, we believe for tenured doctors, quantity of photos is extremely important. This helps showcase the physician as an expert at the procedure, but also improves SEO rankings and authority with search engines. Triplicate the benefit with the reality that patients love to find examples of results similar to those they seek and you have a recipe for success when you develop impressive photo galleries with our assistance. 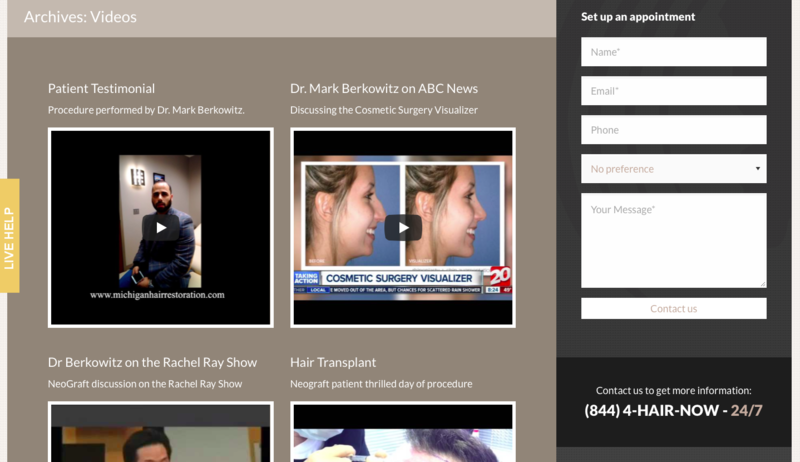 Dr. Berkowitz is the official hair transplant doctor of the Detroit Lions cheerleaders. That is a fun fact, but Dr. Berkowitz is a serious doctor. 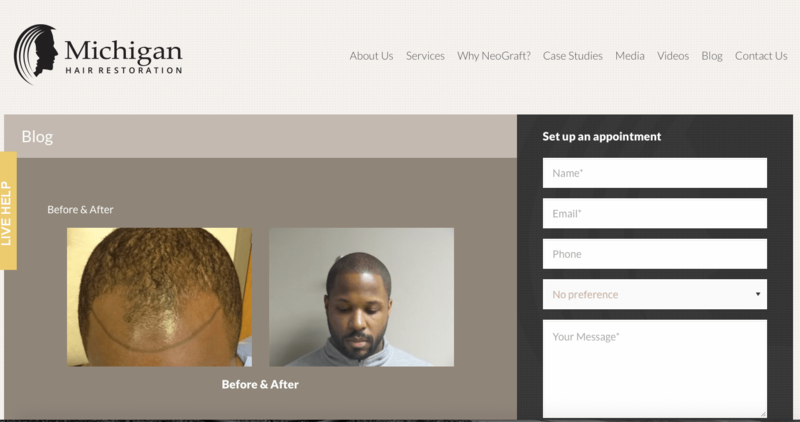 Here we showcase a superb before/after photo using large photo size, high-definition photography, and develop an easy-to-navigate gallery showcasing a variety of hair types and hair loss patterns to improve conversion rates. We also have calls to action throughout the website for ease of access for patients to submit contact information, a proven strategy to grow conversion percentage onsite.